Ας γνωρίσουμε καλύτερα το ενδιαφέρον Remnant: From the Ashes της Gunfire Games (Darksiders 3). To Remnant: From the Ashes είναι συνεργατικό survival-action shooter τρίτου προσώπου, στο οποίο μαζί με έως άλλους τρεις παίκτες πολεμάτε τέρατα από μια άλλη διάσταση που εισβάλλουν στην Γη. Οι μάχες συνδυάζουν πιστολίδι και melee, ενώ τα επίπεδα δημιουργούνται δυναμικά προσφέροντας μια διαφορετική εμπειρία κάθε φορά που παίζετε. Το Remnant: From the Ashes αναμένεται 2019 για PS4, Xbox One και PC. Δείτε επίσημα χαρακτηριστικά και νέο gameplay trailer και πείτε μας εντυπώσεις! • FIGHT. ADAPT. OVERCOME. - Each world will presents new challenges and perils to overcome. Throughout their journey, players will encounter dozens of monsters unique to each environment. Fight tooth-and-nail against creatures both big and small - from towering behemoths the size of buildings to countless hordes of small, deadly terrors. Adapt… or die trying. • EXPLORE FANTASTIC, TERRIFYING REALMS - Explore beautiful, dynamically-generated worlds – each with their own unique creatures and environmental challenges. Gain experience and adapt new strategies to survive the dangers of each world. • CRAFT. UPGRADE. SPECIALIZE. - Band together with others to improve chances of survival. Protect and befriend skilled tradesmen and offer them the safety of a home base. In turn, they will offer valuable skills and resources for upgrades, crafting and enhancements for weapons and gear. • STRENGTH IN NUMBERS - The Root are ruthless and deadly. To stand a chance, players will need help - they need a Team. 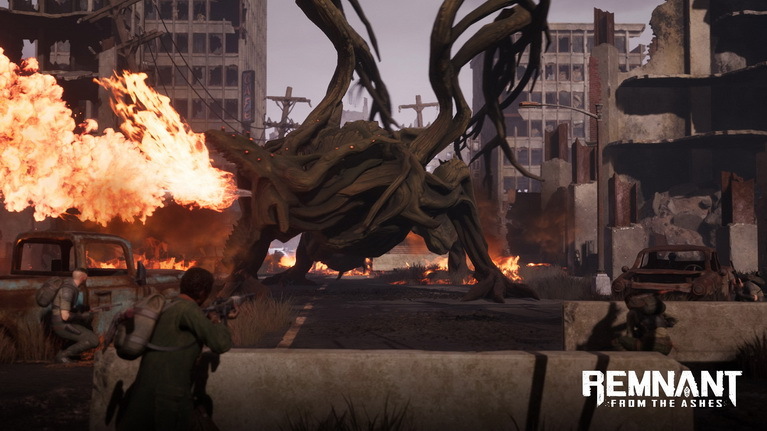 In Remnant: From the Ashes, players can group with up to three other survivors. There are multiple hero archetypes to choose from, each designed with unique skills and advantages to help the group survive.